Midnight in Moscow – Tomato Town organically grows heirloom tomatoes in the greater Kansas City area as well as Johnson County, Leawood, Lenexa, Olathe, Shawnee, Merriam KS, Independence MO and Kansas City Missouri, KCMO. Varieties include: Cherokee Purple, Brandywine, Stupice, Carbon, Black Krim, Black Cherry, Yellow Pear, Absinthe and Aunt Ruby’s German Green. We had high hopes for this tomato. It has all the allure of the of the black varieties, but none of the taste. Not to say that it isn’t a good basic tomato, it just lacks the sparkle that we’ve come to expect. 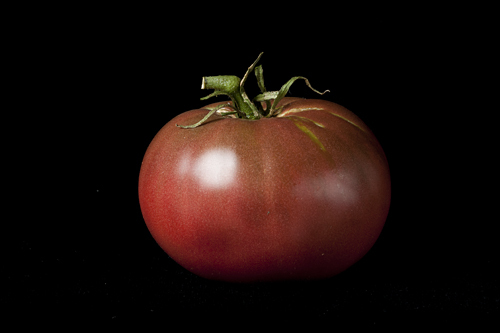 Compared to Carbon and Cherokee Purple, this tomato just does not stand up to the test. This entry was posted on Monday, July 23rd, 2012 at 6:40 am. It is filed under Varieties. You can follow any responses to this entry through the RSS 2.0 feed.